The goal of authorized Mac clones was to broaden the Mac market by producing lower cost Mac OS computers to complement Apple's higher end PowerBook and Power Macintosh computers. At least that was CEO Michael Spindler's hope. Although Bill Gates had recommended that Apple license its ROMs and operating system when the Macintosh was introduced in 1984 - which probably would have meant no Windows™ - Apple chose to keep its closed system and did everything within its power to prevent a clone market from arising. Over the years, there were various attempts to clone the Mac, but most of them required using ROMs from a Mac to function. It wasn't until December 1994 that Apple began licensing Mac System 7.x and Mac ROMs and motherboard designs to Power Computing, Radius, and others at a flat rate of $50 per machine. The first clones shipped in 1995. Unfortunately, this was also the year Windows 95 reached the market, the first version of Microsoft's operating system generally perceived as being Mac-like enough to give the Mac OS serious competition. Radius was the first licensee to bring a clone to market. Without its own production facilities, Radius contracted with IBM to produce its computers. The System 100, introduced in March 1995, was essentially a modified Power Mac 8100 motherboard in a heavy duty tower enclosure. It was available in 80 MHz and 110 MHz versions. Other than the case, which was built like a tank, the two big differences were that is used the standards Macintosh DA-15 video connector on the motherboard (Apple was flirting with a 45-pin AV port at the time) and inclusion of a Radius Thunder IV GX 1600 accelerated NuBus video card that supported resolutions to 1600 x 1200 at 24 bits. The System 100 was followed by the 110 MHz System 81/110, which Radius positioned as a lower cost alternative to the System 100. The secret to the lower price? It didn't include a Radius video card. Radius didn't fare well in the Mac clone market and sold its clone division, along with the SuperMac brand that it had acquired in 1994, to Umax in 1996. We'll look at that below. The first Mac licensee was Power Computing, a new company formed by Steve Kahng specifically to enter the Mac market. Unlike Radius, which used a modified Macintosh motherboard, Power Computing contracted with IBM to build a four-layer motherboard for its earliest clone, which was the second clone to market. The first models, introduced in mid-1995, were the Power 80, which ran at 80 MHz, the 100 MHz Power 100, and the 120 MHz Power 120. They shared a pretty generic looking desktop enclosure that could easily be mistaken for a Windows PC. These were the clones Power Computing sold that used NuBus expansion slots exclusively. Power Computing sold 50,000 computers in 1995. Over the two year clone era, Power Computing built several other models that used PCI expansion slots and Apple's CPU daughter card design. Power Computing was the first to lose its license to clone. Apple acquired Power Computing's Mac division in September 1997 for $100 million in Apple stock. Power Computing tried to enter the Windows clone market but failed, going out of business on December 31, 1997. As far as I knew before researching this article, Power Computing had not licensed Mac OS 8. However, there were Power Computing Mac OS 8 install discs included with some late Power Computing models. Like Radius, which made monitors and video cards, DayStar also had a presence in the Mac market before the clone era. DayStar's CPU upgrades were relatively popular, and the company leveraged its reputation when it entered the Mac clone market in October 1995 with its Genesis MP line of tower computers. The Genesis MP distinguished itself as the first multiprocessor Mac OS computer: The Genesis MP 528 had four 132 MHz PowerPC 604 CPUs. It was later joined by the quad-processor MP 600 and the dual-processor MP 300. When the PowerPC 604e arrived, DayStar renamed the model the Genesis MP+, and the most powerful version had four 233 MHz CPUs. The computer was built like a tank and weighed 50 lb. Unfortunately, DayStar CPU cards were sometimes afflicted with microfractures caused by heat. This occurred after long periods of extensive use. Fortunately DayStar used the standard Apple daughter card connector, so those suffering from failed CPU cards could upgrade to a G3 or G4 for a lot more computing power. DayStar became the darling of the power user set, especially early high-end digital photographers who could take advantage of those additional CPUs in Photoshop. Unfortunately, the classic Mac OS itself was unable to use more than one CPU, and very few programs for the classic Mac OS were written to take advantage of additional processors. DayStar licensed its multiprocessor technology to Apple, which incorporated it in high-end Power Macs. DayStar Digital went out of business in 1997, and Daystar Technology was launched to provide ongoing service and support for DayStar clones and accelerators. Daystar Technology went on to acquire the XLR8 brand and produced G4 upgrades for the Power Mac G3, WallStreet PowerBook, G3 iMacs (both tray-loading and slot-loading), Sawtooth Power Mac G4, Lombard PowerBook, Pismo PowerBook, Titanium PowerBooks, G4 iMac, and Aluminum PowerBooks using the XLR8 brand. DayStar's Genesis inventory was acquired by MacWorks, which built the DayStar Millenium from Genesis MP and MP+ components. Options included a low-end 132 MHz 604 CPU, dual 200 MHz 604e CPUs, and a 325 MHz G3 (in reality, an overclocked G3/300). Umax entered the field in 1996 with four models: the "pizza box" C500 desktop, the C600 minitower, the J700 full-sized desktop, and the S900 tower. Umax's innovations included two CPU daughter card slots in the S900, which made it possible to add a second Umax CPU card and create a dual processor system, and CacheDoubler, a 1 MB inline level 2 cache for the C500 and C600 that ran at double the motherboard's 40 MHz bus speed, making a 280 MHz model possible. Of the several Mac licensees, Umax seems to have been the most innovative and the most interested in broadening the Macintosh base. The C500 was one of the most compact PowerPC models ever, and it was very attractively priced for entry-level buyers. Umax designed two models specifically to accept G3 upgrades: The J710 desktop was built in the same case as the C500, and the S910 tower made some changes to the S900 design. They got around Apple's restrictions on new models by shipping these computers with 604e CPUs and including a G3 upgrade from NewerTech that the user would install. Umax stretched out its license as long as possible, and Apple even offered it the chance to continue in the sub-$1,000 market, but without the more profitable high-end models, the SuperMac division would not be viable. Even though Umax was the lone cloner to acquire a Mac OS 8 license and actually shipped some computers with OS 8, it was too little, too late. On May 27, 1998, Umax threw in the towel, the last of the Mac clone makers to fall. A handful of staffers kept SuperMac support running until late December. Kennedy Brandt, who worked for Umax at the time and runs SuperMac Insider, reports that Umax sold about 100,000 SuperMac computers "before the line met its premature demise." My first PowerPC Mac was a Umax SuperMac J700, which I bought in June 1998 at a "fire sale" price after Umax's license expired. I later added an S900, and both were great workhorses until I bought a PowerBook G4 in January 2001. I have each of the original SuperMac models in my collection. Motorola, one of Apple's partners in the AIM alliance that created the PowerPC family of CPUs, was another licensee. Its first clones, the StarMax 3000 and 4000, reached the market in September 1996. They had a motherboard similar to Apple's poorly received Power Mac 4400 but also included standard PC keyboard, mouse, and VGA ports. One outstanding feature was Motorola's five-year warranty. MacKiDo reports that Motorola shipped over 40,000 units in 1996. Unfortunately, Motorola lost its Mac license in September 1997, months after its second-generation StarMax 5000 was introduced. It's next-generation CHRP-based StarMax 6000 was stillborn. Motorola not only built its own clones, it also sold motherboards to other companies, such as Mactell. There were a few other clones from companies such as APS Technologies, MaxxBoxx, MacTell, Pioneer, and a handful of others. These clones were built on licensed motherboard created by Motorola or IBM, which never produced a Mac clone of its own. None had a significant market presence. At the same time Apple was creating a Macintosh clone program, it also developed Pippin, a multimedia player based on Macintosh architecture. Bandai was the only company to license the technology, and its @World Player, released in 1995, bombed in a market dominated by Nintendo, Sony, and Sega. Apple sold 4.5 million Macs in 1995, a level it wouldn't reach again for a decade. With the clone program in place and competition from Windows 95, that dropped to 4.0 million in 1996 and 2.8 million in 1997. That was the year the word "beleaguered" became widely attached to the Apple name. Hard numbers are not available, but it's generally estimated that the clones accounted for about 15% of all Mac OS computers sold in 1997, the last year with multiple clone makers. If this is correct, Apple could have sold 3.2 million Macs in 1997 if they'd kept the market its alone. Still beleaguered, but a 20% drop in unit sales is better than a 30% one. Not only did Apple ultimately lose money on the clone program, it also had two changes in leadership during this period. Gil Amelio replaced Spindler in January 1996, and Apple acquired NeXT that December. That brought Steve Jobs back to Apple, the man who would oust Amelio and become interim CEO in July 1997. One of Jobs' first projects after returning to Apple was renegotiating the clone licenses to increase Apple's royalty on each unit sold. The increased royalty would have made it impossible for Power Computing, Motorola, Umax, and the others to continue undercutting Apple on price. When the clone makers balked, Jobs took advantage of a clause in the agreement that specified that it only applied to System 7. By naming what was intended to be Mac OS 7.7 "Mac OS 8", he left the licensees out in the cold. The renamed OS was released on July 26, 1997, and none of the clone makers agreed to the more costly licensing terms that would have allowed them to offer it. As many clone owners discovered, all of the authorized clones ran Mac OS 8 just fine. There are clone users today who are running Mac OS 9 on their decade old computers. (Some are even running hacked versions of OS X.) Not being able to offer OS 8 made the licensees' models less attractive to buyers and put pressure on them to accept Apple's new license terms or quit the business. DayStar digital threw in the towel in August 1997, and on August 30, Apple ended support for clones in its Mac OS-Up-To-Date program. On Sept. 3 it announced the acquisition of Power Computing, probably the most successful cloner and the greatest thorn in Apple's side (Power Computing had been offering faster models ahead of Apple - and at lower prices). Motorola left the market at the end of the year, when its license expired, and Umax SuperMac hung in until the bitter end. Apple was working with Umax to license Mac OS 8 for low-end clones - specifically the sub-$1,000 market - but Umax realized there wasn't enough money to be made if they abandoned the high end of the market. Umax decided to close its SuperMac clone division on May 27, 1998 and liquidated its inventory, creating some incredible buys for those willing to take a chance on unsupported hardware. That was also just three weeks after Apple had previewed the $1,299 iMac, which would have had a devastating effect on the sub-$1,000 Mac market had SuperMac decided to pursue it. Since June 1998, Apple has stood alone in the Mac OS market. As we look back at the era of authorized cloning, it's interesting that Apple's transition from PowerPC to Intel CPUs has created a new cloning subculture: People are running Mac OS X on stock Windows computers or machines they've put together themselves. These so-called "hackintosh" computers provide the Mac experience to those willing to spend a little time hacking the OS to run on the kind of hardware they prefer, whether that's a subnotebook, a Tablet PC, or a high-end video production or gaming machine. If Apple chooses not to create hardware to address the needs of these users, it would be great to see them either create a new version of the authorized clone program or simply start selling a version of OS X that can run on stock Windows PCs out of the box. Until then, they seem to be unofficially tolerating the hackintosh market. * It's hard to pick a specific date for the end of the clone era. 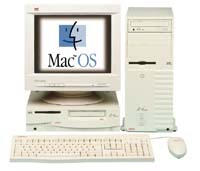 We could pick July 26, 1997, the date Mac OS 8 began shipping, since it was not licensed for most clones. We could choose Sept. 3, 1997, the day Apple announced its acquisition of Power Computing. We've picked August 30, as that was the day Apple announced that the Mac OS-Up-To-Date program would no longer support clones. The end of the end of the era came on May 29, 1998, the day Umax threw in the towel and discontinued its SuperMac line of clones. 1988 - Dynamac transportable based on Mac Plus. 1989 - Outbound and Colby produce portables based on Mac SE and SE/30. Apple acquired Outbound in August 1990.
circa 1990 - 60000 Dash 30fx, an overclocked, repackaged Mac IIfx. 1994 - Apple, IBM, and Motorola announce Common Hardware Reference Platform (CHRP), a PowerPC platform that will be able to run the Mac OS, Windows, OS/2, and Unix. The only CHRP Macintosh clone ever produced was the unreleased Motorola StarMax 6000. 1994.11 - Motorola and Power Computing show clone prototypes at Comdex. 1994.12 - Apple licenses Power Computing as the first company authorized to produce a Macintosh clone. 1995.03 - Radius introduces System 100, first authorized Mac clone to market. 1995.05 - Power Computing introduces Power 80, 100, and 120. 1996.01 - Radius exits clone business, sells division to Umax. 1996.05 - DayStar and Umax SuperMac clones reach market. 1996.09 - Motorola StarMax computers begin to ship. 1997.07.26 - Mac OS 8 ships. No clone allowed to ship with OS 8, which marks the beginning of the end for the clones. 1997.08 - DayStar Digital exits clone business. 1997.09 - Apple buys Power Computing, closes their clone business by end of year. 1997.12 - Motorola exits clone business. 1998.05 - Umax exits clone business. Apple stands alone. 2006 - Apple transitions from PowerPC to Intel CPUs, launching a new era as users hack the Intel version of OS X to run on stock PCs. This list is ordered by the date each brand first came to market. It is far from exhaustive. EveryMac has an exhaustive list of authorized and unauthorized Mac clones. Radius, Mar. 1995 to Jan. 1996. Began selling video cards and monitors for early Macs in 1986. Sold SuperMac brand and cloning business to Umax in 1996. Attempted to refocus on video business. Acquired by Media 100. Power Computing, April 1995 to Dec. 1997. Formed in 1994, first licensee, second to market. Clone business acquired by Apple. Power Computing closed its doors in Dec. 1997. Pioneer, May 1995 to Oct. 1997, Japan only. Longtime player in the consumer electronics field remains in business. DayStar Digital, May 1996 to Aug. 1997. Started in 1983 to build circuit boards, released RAM for Mac in 1986, entered CPU upgrade market in 1987, went out of business at end of the clone era. Umax SuperMac, May 1996 to Aug. 1998. Longtime maker of scanners, last clone brand to close up shop, remains in peripherals business. Motorola StarMax, Sept. 1996 to Dec. 1997. Motorola has been around since 1928, long before the first personal computers, and remains in business. MaxxBoxx, July 1997 to Feb. 1998. Built in Germany, these clones had lots of room for additional drives. MacTell, Aug. 1997 to Oct. 1999. Shifted focus to CPU upgrades and video cards, went out of business in Oct. 1999. APS Technologies, Nov. 1996 to Jan. 1998. Company began selling Mac peripherals and continues to do so.